The US and EU have called for Syria’s leader to step down. But can China and India ever be brought on board? With regime change now the stated objective in Syria, the White House issued tough economic sanctions on the Assad regime earlier today. However, having failed to solicit widespread international support for the sanctions at the time of the announcement, the administration has assumed a major risk and needs to quickly shore up regional support for its position, especially from Turkey and Arab States. The Administration also must ensure that China, India, and Russia don’t undermine US and EU efforts to build regional and international support to remove Assad from power. According to sources, both efforts will require an extraordinary diplomatic effort, and one that’s far from certain to succeed. When asked about the effectiveness of such energy sanctions, Mark Parris, former US ambassador to Turkey and non-resident senior fellow at the Brookings Institution, said that he believes that they will introduce short-term economic disruption as Syria seeks to revamp its export regime, line up new buyers, finalize financial terms, and start shipping Syrian-origin petroleum or petroleum products. This could put additional economic pressure on a regime already under significant political and social pressure, especially if such sanctions are widely supported by the international community. With thisin mind, the administration has been working to secure widespread international support for tougher action against Syria, including intense diplomatic outreach to the European Union, Turkey, and Arab states. Europeans have been strong supporters of action against Syria, including UN Security Council efforts. Today’s European Union and Canadian statements in support of US policy are therefore not a surprise to insiders. They also weren’t caught off guard by the British-German-French tripartite statement, which not only calls on Assad to go, but also expresses support for even stronger EU sanctions. However, some are dismayed that the administration failed to garner stronger regional support prior to today’s announcement. According to one Congressional staffer I spoke with who has direct access to US diplomatic efforts with regional allies, this wasn’t for lack of effort. But now that the executive order has been issued without a shared regional position, the White House must hope that Turkey and Arab states soon will align their stance with that of the United States. In the broader international community, analysts believe that China continues to harbor serious reservations over taking further action against Assad. As a veto wielding member of the Security Council, this Chinese reluctance undercuts US efforts to secure both the support of regional allies, as well as that of the international community. While China’s typical foreign policy concerns with American hegemony and state sovereignty are central to this opposition, a number of other factors are at play. How China seeks to manage this emerging economic relationship from a diplomatic perspective will be of great interest to the Obama administration – both with respect to the current crisis in Syria and beyond. But Parris raises another important concern – the Chinese position that the Arab Spring could spread to Central Asia. For China, that contagion effect – an ‘Aral Fall’ – would threaten core Chinese security interests along its borders. A Congressional staffer privy to the Chinese position substantiates this analysis, but cautions: ‘Central Asia is a concern to China…but it shouldn't be. You aren't going to see protests in Kazakhstan and the Kyrgyzs already went through their issues last year.’ Furthermore, the staffer believes that the Chinese shouldn’t fear the administration supporting protests in Uzbekistan given US strategic interests in the country. In the end, the staffer believes that this won’t spread across the Caspian. However, China must be wary of the massive redrawing of the political landscape of the Middle East, which has serious consequences for the national interests of all major powers. The potential to influence the global balance of power makes the Central Asia issue cause for concern, and the Chinese are unlikely to acquiesce to Syrian engagement unless this concern is mitigated and China assesses how its national interests have been affected by the fallout from the Arab Spring – especially Libya. With US Vice President Joe Biden currently in China on a previously scheduled visit, the White House has a unique opportunity to personally address Chinese concerns and court their support for regime change in Syria. However, the probability of a major breakthrough on Syria cooperation seems unlikely. According to one Congressional staffer, ‘Biden has no leverage in China,’ which undercuts any chance of soliciting broader support for the US policy shift. In the eyes of experts, there are a number of reasons why it would be difficult for Biden to secure Chinese support. The most important may be Syria’s prioritization in broader Chinese-US relations. For China, the global economic crisis and US debt are of primary importance to this trip as these undercut Chinese economic growth and stability objectives. For both sides, Syria also isn’t the top security issue on the table. According to a Congressional staffer, this week’s meeting agenda includes a number of other more important security issues, including North Korea. The two also have taken time to discuss Asia-Pacific regional security, a more important long-term interest for both countries. Separately, the administration lacks a major diplomatic token in exchange for Chinese support, such as acquiescing on disputed arms sales. Today’s reports that the Whit House quietly informed Taiwanese officials last week that Washington won't supply Taipei with newfighter jets takes one such option off the table. While the Taiwan move might be positive for broader Chinese-US relations, which clearly take precedence over Syrian regime change, it means that the administration lacks an obvious incentive for securing Chinese support. This suggests that coming up with one should be a priority for US officials tasked with regime change in Syria. It’s clear from conversations with senior administration officials that the United States wants the UN Security Council and Human Rights Council to back stronger action against Syria in light of the ongoing violence in the state. For its part, India has failed to take a strong diplomatic stance and call for regime change in Syria. Some experts, such as Islam Qasem, analyst at the Hague Centre for Strategic Studies and adjunct lecturer at Leiden University in the Netherlands, also believe that Indian may seek to exploit the energy sanctions and increase its share of the Syrian energy market. Separately, the United States and EU face opposition from Lebanon, which currently speaks for Arab countries on the Security Council. 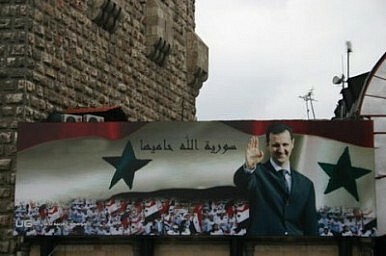 Given its relationship with Tehran and Damascus, Parris believes that ‘the US can’t get Lebanon to go against Assad’ given Hizbollah’s tradition of advocating foreign policy positions in line with that of Iran and Syria. Now that the executive order has been signed, the United States and EU must wait to determine its effectiveness. In the meantime, the administration still must consider what to do next should the energy sanctions fail to achieve regime change. According to one senior administration official I heard from, ‘I don't think anybody believes that that is the desired course in Syria – not the United States and our allies, nor the Syrian people themselves.’ It therefore appears that the White House, which currently lacks a regional ally to lead foreign intervention into Syria, hopes that the sanctions will prove effective and topple the regime. But, if they fail, military intervention in Syria may be required. The question some experts are asking is does the United States have the regional partners required to affect regime change through multilateral action. In the minds of many, Turkey will be key to that discussion. However, Turkish experts caution the administration that it’s unlikely that Turkey will lead any military intervention into Syria. For Ozcan, the unlikelihood of Turkish participation in a military intervention in Syria can be attributed to four factors: 1) Legitimacy of a military intervention will be very difficult to maintain in domestic policy; 2) Turkey has very bad historical experience of military interventions for its neighbouring countries, such as Iraq in 2003); 3) The Syrian case will affect negatively not only Turkey-Iran relations, but also the whole region; 4) The current civil-military relationships in Turkey doesn’t provide the best conditions for a military operation. As the United States seeks to build a larger coalition of partners supportive of ousting Assad, the challenge for the administration clearly will be to manage the perception that the United States and EU can’t deliver on regime change in Syria with certainty in the absence of a hard power back-up option with Turkey in the event that sanctions fail. In drawing up contingency plans, the United States therefore needs to consider alternatives. These likely include unilateral military intervention that relies heavily on US and EU naval and air assets exploiting Syria’s long coastline. Another option would be to shore up the support of Arab countries, including the Jordanians, Iraqis, and Saudis, independent of Turkey and have them lead a military intervention across Syria’s southern or eastern borders. To many experts, the best alternative would still be to secure Turkish leadership for military intervention if it becomes necessary beyond basing and overflights. However, the shadow of the aborted invasion of Northers Iraq in the Second Gulf War reminds everyone that this might not be possible. Should the energy sanctions fail, experts therefore suggest that another option would be to issue more sanctions or put in place a maritime blockade to enforce the energy sanctions prior to jumping to direct military intervention. However, it’s unclear if Turkey and other players would support this effort, especially if the blockade extended into the sovereign waters of littoral states. Following today’s actions, there’s no doubt that the United States has taken the lead on calling for regime change in Syria. The more pertinent question now is how large and influential the ‘chorus’ will be in the weeks ahead, and what song are they singing. If it’s an empty auditorium with just the United States and its European allies up on the stage, it probably will be a long a difficult performance.